It has actually been a really long time since the car has just broken down on me. But it happened today. Lucky for me the timing was good. My plan was to warm up the car then adjust the idle mixture. But as I was backing out of the garage the brake pedal felt mushy. Then it went to the floor. Craptacular! 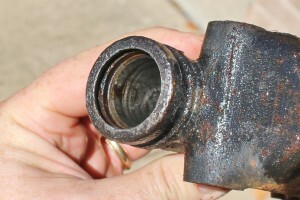 When I looked under the car there was an obvious puddle under the master cylinder. So I put the car up on ramps (tricky with no brakes!) and took a look. Now for a little history lesson. Anyone who has driven a manual transmission knows that the least fun thing to do is to get the car rolling up a hill. 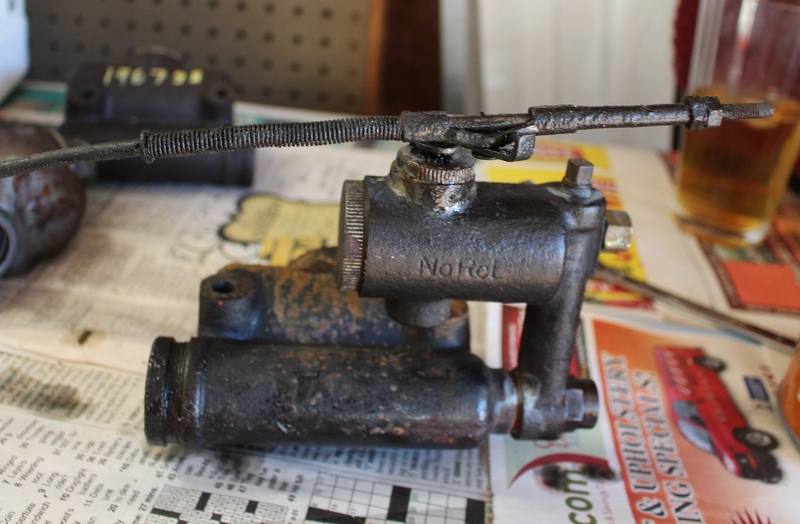 To address this problem Lockheed-Wagner invented a “NoRol” device. The idea was simple. On a hill if the clutch pedal is depressed while the brake is on a valve holds brake pressure. The driver can then take their foot off the brake without the car rolling back down the hill. When the clutch is released so is the brake. Studebaker liked the idea so much they bought exclusive rights to it and called it the “Hill Holder”. This was a selling feature of Studebaker cars for years. My car has one. And now it leaks. 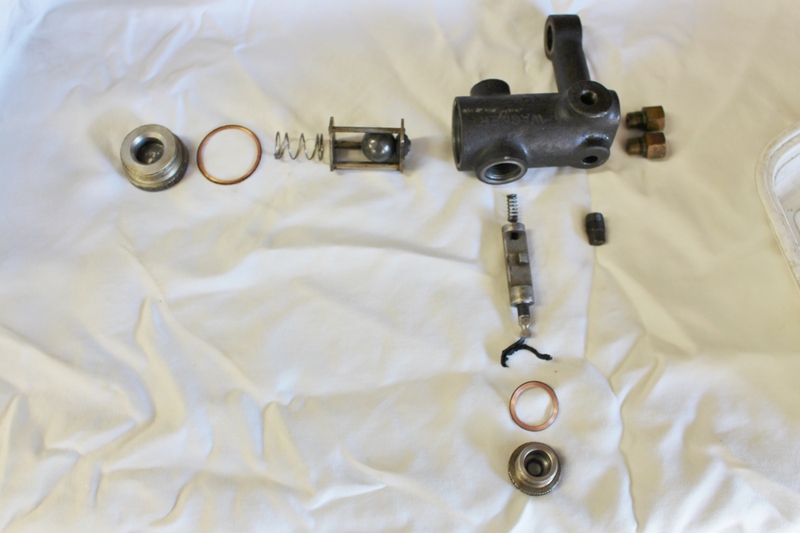 Here is the master cylinder removed from under the car. I have been in here before. In fact more than once :(. But it has been 11 years and I have been kind of expecting a problem. Now I have two. The big leak is around the control shaft for the Hill Holder (that serrated thing at the top of the picture). There is also some seepage in the main bore of the master cylinder. You can clearly see some goop seeping out around the control shaft. This is probably the remains of the old seal turned to mush. 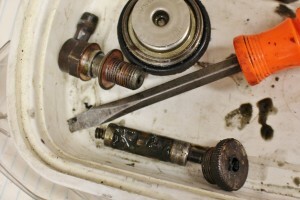 To take this apart the two serrated plugs need to be removed. So I mounted the Hill Holder in my vice and got out a medium-sized pipe wrench. The control shaft collar came off first without too much drama. 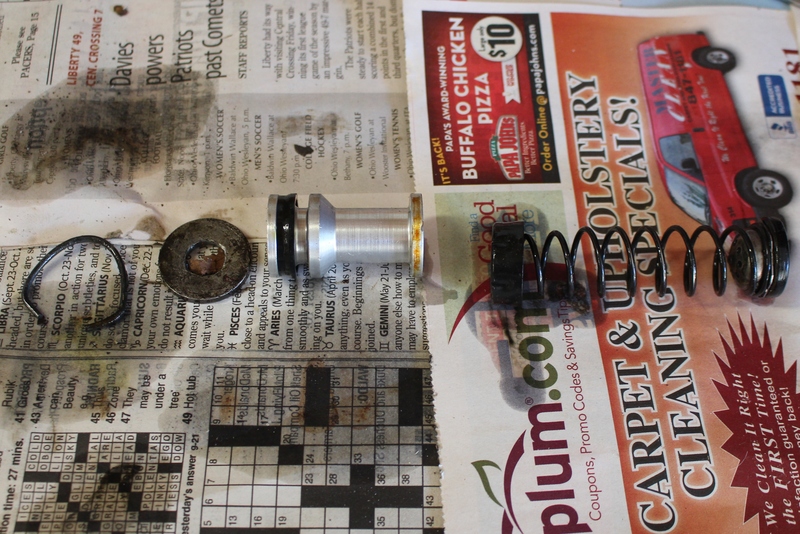 Here is the shaft and collar right after I removed them. The big plug in the end of the Hill Holder was more interesting. I had to get the Hill Holder securely mounted in the vice and lay into it. Strips of scrap plywood were used to avoid damaging the machined surfaces of the casting. 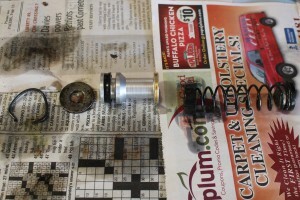 When the cap came off the inside was full of gunk. Finally the internals came out. This is pretty cool. But can I get it back together again? 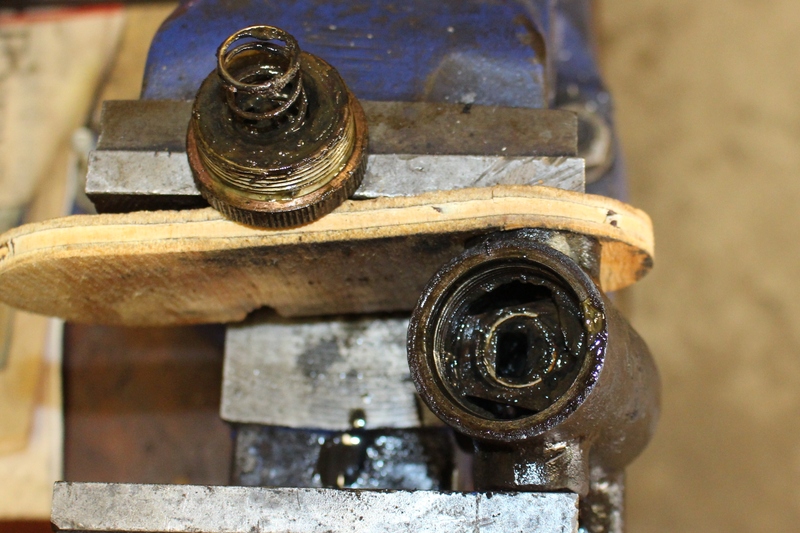 It seems what happened was the rubber seal on the control shaft turned to mush and clogged up the internals of the Hill Holder. 70 years will do that. 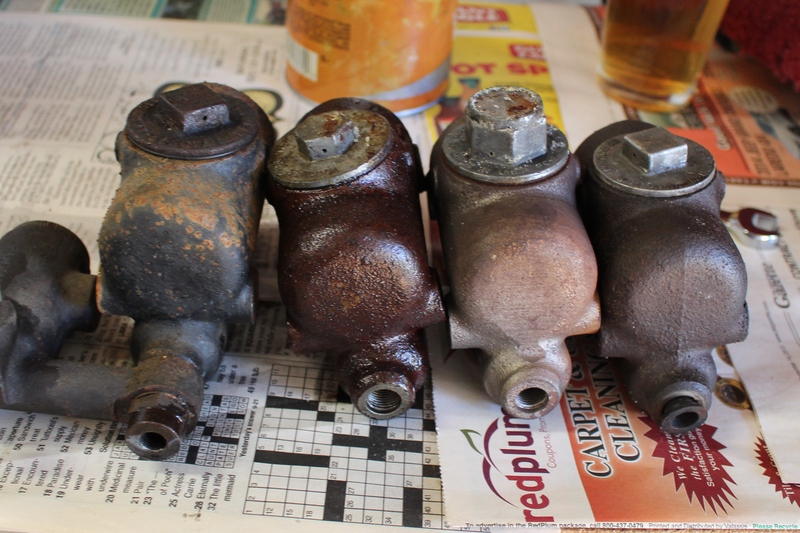 The good news is that once I cleaned everything up the parts all appear to be in good shape. Here are all the parts laid out in an exploded view. 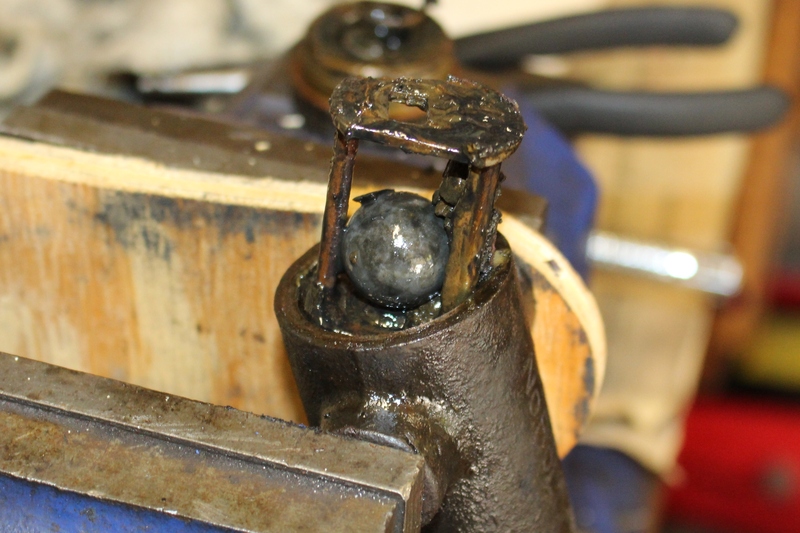 That little scrap of rubber below the control shaft is all I could find of the shaft seal. You can see how this works. The ball in the cage has a rubber seal that is pushed up tight against the inlet from the master cylinder by the big spring. So when the car is pointed uphill the ball wants to roll back against the seal. 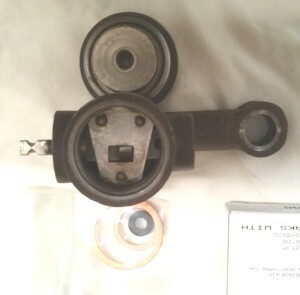 When the clutch is pushed the control shaft rotates and pushes the cage against the seal. 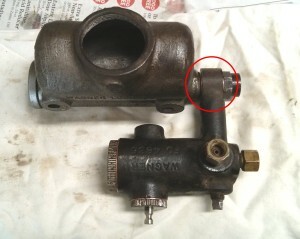 This allows the ball to roll against the seal holding the brake pressure. When the clutch is released the cage pulls back forcing back the ball and the brake is released. Now on to the master cylinder. It comes apart in moments. 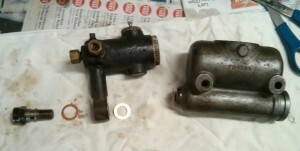 All the parts are in pretty good shape but there is some rust and pitting in the bore. 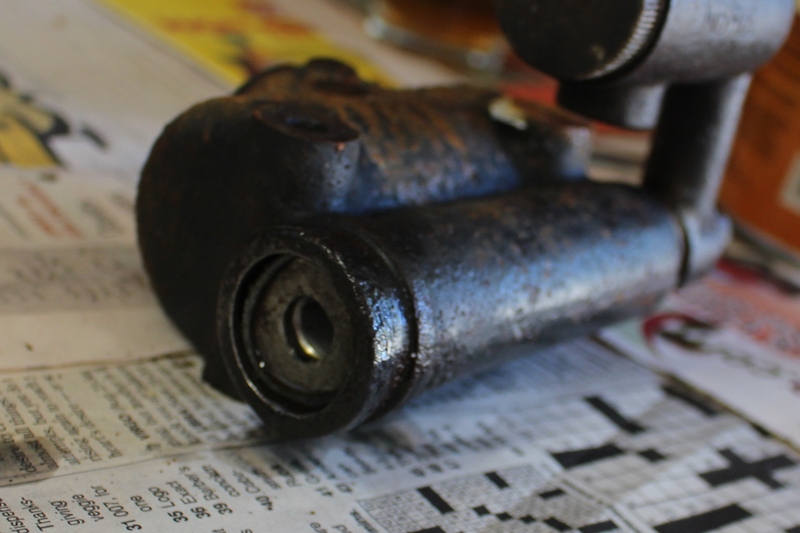 I was not super happy with the condition of the cylinder 11 years ago and it has not improved with age. Lucky for me I seem to have quite the collection of master cylinders. 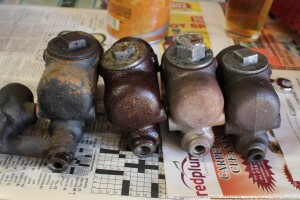 The third one from the left is a factory rebuilt unit that was never installed. I took it apart too and it looks like new inside. I may just use that one instead. So now I have some parts buying to do. It turns out the seals for the Hill Holder are all available. 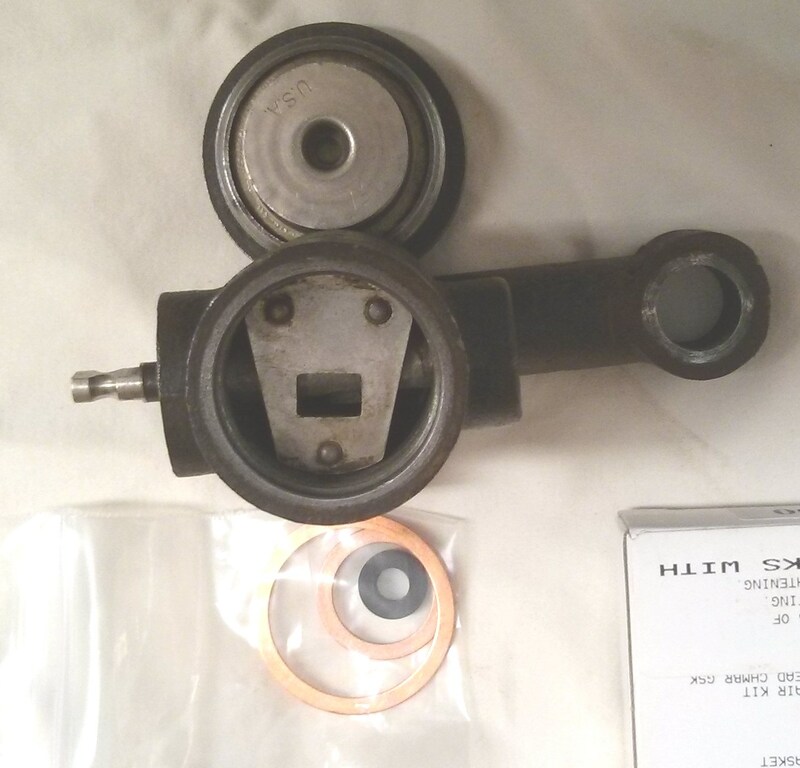 I also ordered new copper sealing washers and a rebuild kit for the master cylinder. Once the parts arrive I can start putting this all back together. A week later I had all the parts. After carefully cleaning everything it was time to reassemble. 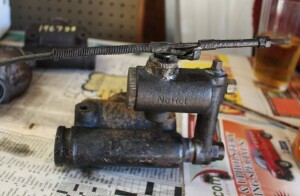 First step was reinstall the ball cage and operating shaft in the Hill Holder. The two pictures below show the shaft in the engaged and disengaged positions. You can also see the new seal kit below. The rubber seal goes around the operating shaft and is what failed to start this party. Next comes the shaft retainer. 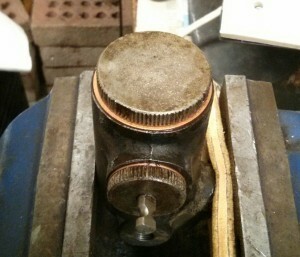 The rubber seal goes under the cap and the copper washer hopefully seals it all up. 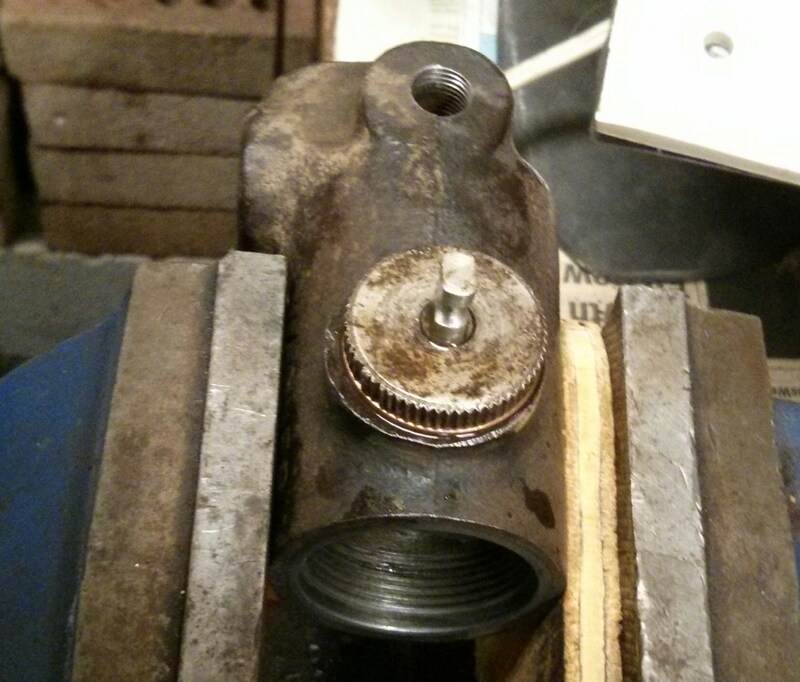 I mounted the Hill Holder in my vice and tightened the cap with a pipe wrench. Same deal with the end cap. I almost forgot the spring that goes under this cap and forces the cage against the shaft and seal. Next I rebuilt the master cylinder. I should have taken pictures but I got rolling and just did it. However it was pretty much the same as last time. Here are all the parts ready to come together. And the final result. Notice the red circle. I have had problems with this leaking before. And it leaks now. Very frustrating. I will try and tighten it up some more. But if that does not work I may have to take this apart and try annealing the copper washers to make them softer. 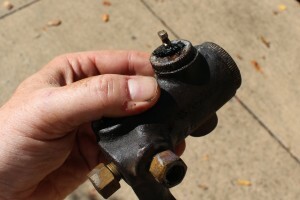 Once the master cylinder was assembled I re-installed it in the car and started bleeding the brakes. But try as I might I could not get a hard pedal. I suspect part of my problem was that the car was not sitting level. But I ran out of time and brake fluid before I could solve the problem. So there will be a part 3 of this saga.